Hoo-rag has become a sponsor for the 2012-2013 USA BASSIN tournament trail. USA BASSIN is a rapidly growing tournament trail that draws anglers from all over the US in search of monster large mouths. Hoo-rags will be going to select boats during this upcoming season. If you are one of it's 17000 members there is a chance you will be getting a Hoo-rag. If you are a USA BASSIN member and want to see what a Hoo-rag is and how to wear one, please watch this video. 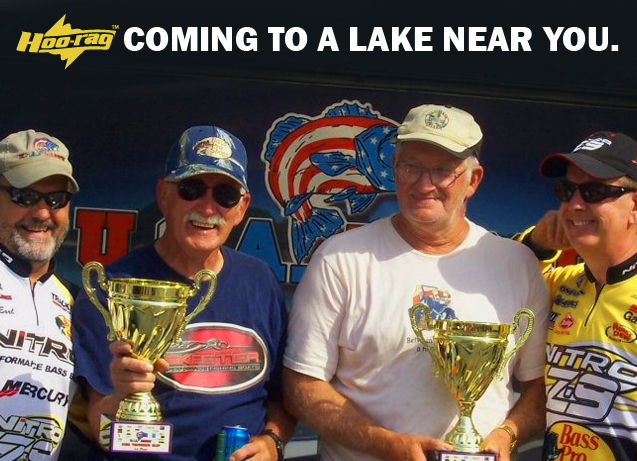 U.S.A. BASSIN is a grass roots team tournament trail, catering to the weekend angler and our youth. We promote a "family-friendly" atmosphere; this allows all team formats to participate, singles, two-person teams, husband/wife and parent/child to experience competitive angling, while learning good sportsmanship. We offer free membership to the Youth under the age of 18 before August 31 of every season in either the U.S.A BASSIN Team Trail or the U.S.A BASSIN Next Generation Trail. We offer low membership fees of $25.00 per adult that includes the right to fish any U.S.A. BASSIN tournament for that season’s year. Entry fees start at $25.00 for a weeknight, and $50.00 for a weekend tournament per boat/team. This makes U.S.A. BASSIN very affordable and fun for everyone! In 2003 U.S.A Bassin was founded on the simple tournament format that we run on to day; low fees with tournaments close to home. At that time we had 60 members in three states. By 2005 we grew to 500 members operating in 5 states. Two years later in 2007, our growth increased to 1500 members and 280 events in 9 states. In 2009 the growth has continued with over 3400 members and over 500 events in 17 states. Moving forward into 2010 we have expanded our tournaments to involve our youth even more with the addition of the “The Next Generation Trail”. The Next Generation Trail is designed to provide educational opportunities to the youth. By offering adult/youth divisions and teams, our youth will not only learn fishing skills, but will also have a chance of being awarded scholarship money towards their future education. Our youth are the future of our sport! The 2009 season’s Classic will be our biggest ever! The 2009 Classic to be held on KY/Barkley Lakes on May 1 & 2, 2010 and will offer members a chance to win one of four new boats (Nitro™ Z8, Nitro™ Z7, Nitro™ X5, and a Tracker™ Pro Team 170 TX draw boat) to be given away along with cash and sponsor prizes to total over $100,000. As we start our 7th year with the 2010 season, we would like to invite you to become a member of our organization to experience a different kind of tournament trail. Come out and see how tournament fishing is supposed to be! Nationally and locally, U.S.A. Bassin has partnered with many companies who believe in U.S.A. Bassin's goals and efforts. Anglers are assured a chance to win prizes, and have fun during the course of the season. Please feel free to browse our web site and register to participate in our Forums/Bulletin board. Thank you from all of us at U.S.A. Bassin. See you on the water!